260 pages | 17 B/W Illus. A secure supply of energy is essential for all nations, to sustain their economy, and indeed their very survival. This subject is especially important in the case of China, as China’s booming economy and consequent demand for energy is affecting the whole world, and in turn potentially driving realignments in international relations. Moreover, as this book argues, energy security should be considered more broadly, to include issues of sustainability, environmental protection and the domestic organisation of energy policy and energy supply. This book presents a comprehensive picture of China’s energy security. It covers all energy sectors – coal, oil, gas, renewables; international relations with all major sources of energy supply – the Middle East, Central Asia, Africa; and key areas of domestic policy making and supply. "Finally, an important feature of the book is the methodological innovation. Many of the contributors are experts in the energy field, while others have more specifi c knowledge of Chinese energy security politics and policies. As such, the data and analyses provided represent an original mixture. 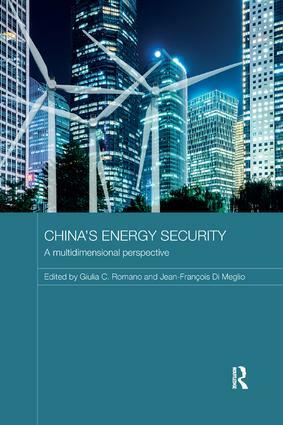 This volume is valuable for all scholars and students with an interest in China’s energy policies, but particularly for policymakers and specialists concerned about getting a real understanding of China’s intricate dynamics, actors and processes in the field of energy security." 3. Gas in China’s Energy Security Strategy: Threat of a New Form of Dependency? 9. Decentralised energy resources as a challenge to the secular top-down paradigm of energy production? Giulia Romano is the Energy Programme Manager at Asia Centre, Paris, France. Jean-Francois Di Meglio is President of Asia Centre, Paris, France.